A boat trip along the Lycian coast is the perfect way to fully appreciate this wild, secluded and undeveloped area of the Mediterranean. Captain Apo will bring you to secluded bays, where we will drop anchor and you will have the opportunity to dive into the clear water, to swim to the shore or to discover the underwater world with snorkel and goggles. We promise to look after you on the trip – grilled fish or chicken will be served with baked potatoes, salad and fresh bread. You'll be surprised how fresh air, sun and swimming can build one's appetite! 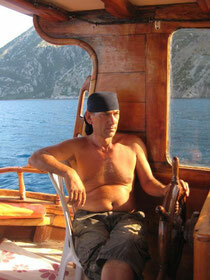 After lunch, with the boat gently rocking in the waves, you can close your eyes and enjoy that holiday feeling. During the journey, you can relax in the shade on deck, enjoying the warm wind on your body and marveling at the natural beauty of the coast, with it's unspoiled cliffs. Sometimes dolphins accompany the boat, and occasionally we are lucky enough to spot a swimming Caretta turtle. On the Sulu island you can see mediterranean seals basking in the sun. In the afternoon, we provide coffee and turkish tea. Cold drinks are available at all times. 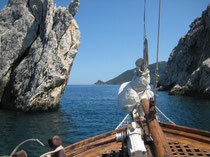 On the pension's own boat "NAZAR", we provide day trips and longer tours. The "NAZAR" is a 14-meter yacht with space for 12 passengers, and is fitted with two cabins, a kitchen, shower and WC. On longer tours, you can sleep either in a cabin or on deck under a star covered sky. Captain Apo will take you in a southerly direction, past the ancient city of Olympos, the bays of Ceneviz and Sazak and the nearby caves to the island of Sulu Ada or to Cape Gelidonya with it's lighthouse and islands, or in a northerly direction past the three islands of Maden Bay to Phaselis. 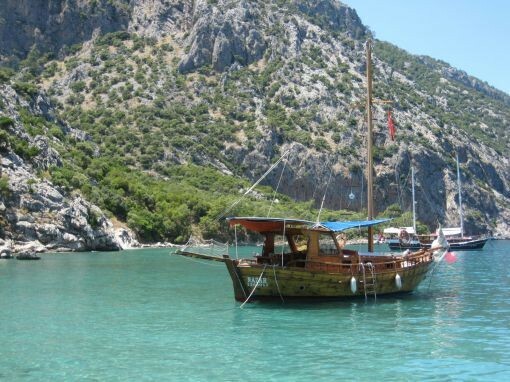 An extended tour is also available to Demre, Kekova, Simena and to a sunken city.